A devastating ending, but a still great book nonetheless. Wade Mullins is sure that he is experiencing a fever-induced dream when he suddenly stands, not in his basement, but in a horse's stall in the land of Marus. A prophet tells him that he's a sign of the Unseen One's destruction and another man is sure that he can rule the country with Wade's help. Wade doesn't know whether he should be involved in the pursuit of power or if he should believe the prophet's words and the Unseen One behind him. In Odyssey, Wade comes into the unintentional possession of some scant plans for the atomic bombs mailed secretly to his best friend. He wishes to burn them before someone else finds them. Most of the characters in this story are degenerate, but all such actions are portrayed as obviously wrong. There is a power-hungry man willing to do anything to get what he desires. Despite all the flack he receives for it, Arin remains faithful to what the Unseen One (Whom we know as God) has called him to do. Wade struggles with understanding what to believe. He grows to learn the very real truth. Bombs, especially atomic ones, are talked about. Items are thrown (no one is hurt), bombs and guns go off (two of them for sure killed someone, one of them being a central character). Wade is kidnapped somewhat roughly. The kidnappers beat each other up to make a lie look effective. He and another man experience some amount of harsh treatment. Arin speaks of potential danger from outside his compound’s walls. Wade has a dream about a devastating atomic bomb and another in which he was killed by bombs. Riots break out (one is witnessed). Many people die curiously of a strange disease. Arin’s wife makes a guess that a mob may be made up of drunks with nothing better to do. (This does not appear to be correct.) Some of Marus’ elders smoke pipes and cigars. 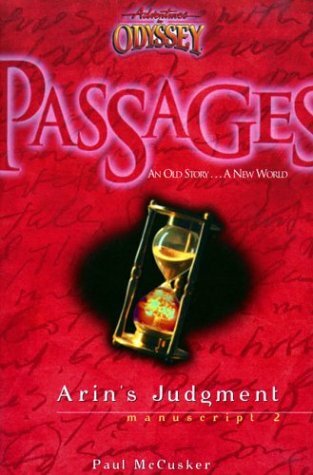 Just as the account of Noah and the Flood on which this tale is based, "Arin's Judgment" is a devastating read. Liberties to change elements are taken, but they do not distract from the legacy of God's simultaneous justice and mercy. (Readers should, however, understand the biblical account before reading a retelling of it.) The truths in this book are also applicable to everyday life.